"Our national bard celebrated life, liquor and love. In lyrics from 'Ae Fond Kiss' to 'My Love is Like a Red Red Rose' he wrote from the heart of romantic Scotland. 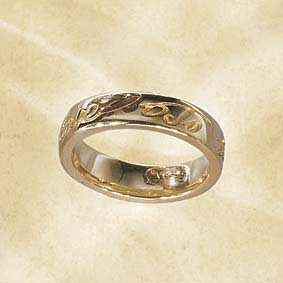 A master-craftsman's recreation of Burns' own handwriting, based on countless hours of study, transforms his words of love into uniquely romantic jewellery." But if commemorative rings and chess sets are your cup of tea, and if your local supermarket is all out of haggis, then perhaps you can still remember Robbie Burns by reading a few of his poems. There are 559 of them on the Robert Burns Country website, including one of my favourites, "To A Mouse, On Turning Her Up In Her Nest With The Plough." "Your new collection of poems, “A Worldly Country,” reminds us of the demanding nature of your work and your resistance to personal confession. Do you think Americans are too enamored of their own life stories? "Yes, I do. In my case, it is things that I don’t know yet that most interest me. My own autobiography is so uninteresting to me I have always thought it surely wouldn’t interest anyone else. "As one of America’s most celebrated poets, you can’t really find your own life boring. "I thought other people would find it boring. My mother was always telling me not to talk about myself or put myself forward. That’s where I got this idea. Whenever I went to visit a friend, she would say, “Don’t wear out your welcome.” I always worried about this throughout life: is my welcome wearing out at this particular moment? "Which hasn’t kept you from publishing a very large quantity of poems, more than 20 collections in all. "If I wrote much more, would anybody read it? Does anybody read it now? There can be such a thing as too much poetry, and I try not to write it." John Steffler, our new Parliamentary Poet Laureate, is already hard at work. He wants to create a Canadian counterpart to the online Poetry Archive began by Andrew Motion in Britain. Personally, I think this is a wonderful idea, and just the kind of thing the PPL should be doing. I'm looking forward to seeing it come to fruition. The Concordia Journal and the Times Colonist have more on the story. "The smelter didn't know the head of the statue of poet Taras Shevchenko was stolen until Tuesday when he read about it in the paper. He bought the piece, along with some smaller fragments of bronze on Dec. 12 from two men who told him they were disposing of the statue on behalf of the city of Oakville, according to published reports. "Robert Currie of Moose Jaw becomes poet laureate of Saskatchewan on Monday, taking over from Louise Bernice Halfe of Saskatoon. 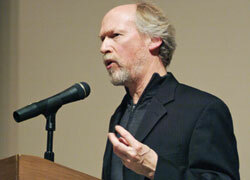 Currie, author of four poetry chapbooks and five books of poetry, will serve a two-year term. F#@&ing Humungous Statue of Poet Shevchenko just F#@&ing STOLEN! This is unbelievable. This statue of Ukrainian poet Taras Shevchenko, unveiled in Oakville, Ontario, in 1951, stands about 10 feet and weighs about two tons, and someone just waltzed in and took the thing, cutting it off at the ankles and leaving its feet on the pedestal. For over half a century this monument has been a visible symbol of pride for millions of Ukrainian Canadians. Shevchenko is often considered to hold a place in the literature of the Ukraine equal to Shakespeare's place in the English canon. I hope they catch the thieves and restore the monument for they melt it down for its valuable bronze. It could be worth over $300,000. There can't be too many places to smelt something like this, so hopefully, it will be found in time. For more to the story, check out the Globe and Mail or the Toronto Star.